Unadulterated sounds, acoustic re-inventions and all round cool vibes consume the Swiss Alps during this fantastic 5 day festival. Zermatt is a stunning choice for a ski holiday and provides snow fans with a unique and memorable experience in the Swiss Alps. Providing a marvellous backdrop to the resort is the triangular Matterhorn Mountain, rising an impressive 4,478 m above sea level and wowing all who come close. Alongside the picture perfect views, Zermatt caters for all levels of ski ability, from complete beginners to advanced and adventurous. Beginners can learn in peace with practice pistes in calm, stress-free areas and with expert tuition. More experienced skiiers can challenge themselves with 360 km of pistes to play with, mountain excursions, ski tours, free riding and awesome heli-tours. Gravity Snowpark is where you’ll find keen snowboarders and freestyle skiers. Apres Ski is as lively or laid back as you like in Zermatt. Choose from any number of inviting bars from pub style lounges with mulled wine on the terrace and live music heating things up indoors, to a charming outdoor champagne bar with killer views. For some tranquil time out several spas and wellness centres are present in two dozen hotels throughout Zermatt, with massage treatments and Jacuzzi’s on hand to soothe any aching bones. Delicious alpine cuisine is available in a range of restaurants within the resort offering top nosh from gourmet cuisine to easy and unfussy favourites. 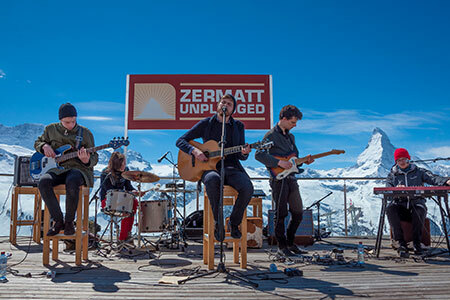 Introduced to the world in 2007, Zermatt unplugged began as a festival for singers and songwriters. Eight years later and still going strong, it now attracts music lovers from all over to come together and enjoy great music in its purest form. World famous musicians perform unplugged, stripped and reinvented versions from their brilliant back catalogues across a multitude of perfectly placed stages. Previous performers include music legends such as Lionel Richie, Alanis Morissette, Billy Idol and OneRepublic. Ronnie Scott’s Jazz All Stars keep a smooth vibe echoing through the mountains, whilst the New Talent stage features a fresh line-up of some of the best up and coming artists on the festival circuit. Follow the music as it moves you from the slopes to the stages and dance your way through to the celebrated after parties with live DJ’s lighting up the nights. Zermatt is a car free resort but you can arrive by train, taxi or even helicopter. Those driving to Zermatt can leave their cars in designated and convenient parking garages just 5 km away in Tasch; before jumping on the famous Glacier Express to complete their journey by train. The direct train takes approx. 3.5 hours from Zermatt-Kloten airport and 4 from Geneva-Cointrin.